As we worked on Esquima, a fighting drill from the clinch, I was totally detached from all the problems outside of class. I was living completely in the moment. Each class has required complete attention of the mind; however, the mind would attempt to day dream or be distracted by chores I needed to do, or other problems.. When the mind wanders, that was when problems started arising in the mind and I would miss details. According to buddhist monks that I follow on YouTube, a wandering mind will lead to unhappiness. I have been trying to meditate, just sitting, not moving, for eight minutes, at night before bed, and focusing on breathing. When you concentrate on breathing, the mind will stop wandering. This may seem like non sense to some. It has taken almost two hundred classes before I could stand at attention without swaying. I learned that swaying while standing at attention was an indication that the mind was not calm. The slight swaying from one foot to the other was mainly due to back pain. I had terrible posture. When the back was out of alignment, the back would pinch on a nerve causing pain. I have been working on improving my posture ever since my shoulder injury in October of 2012. As the instructor would talk, I would have to focus on the mind to stop moving. I had to bring my consciousness to this. I noticed that I wasn’t moving in base, ninety degrees, during technique review and I had bad balance. I always had good balance. During esquima, I was hunched over so my practice partner lightly shoved me to the floor to show that I was vulnerable to an attack. Bad posture and back pain were related. I need to correct these problems of the body. 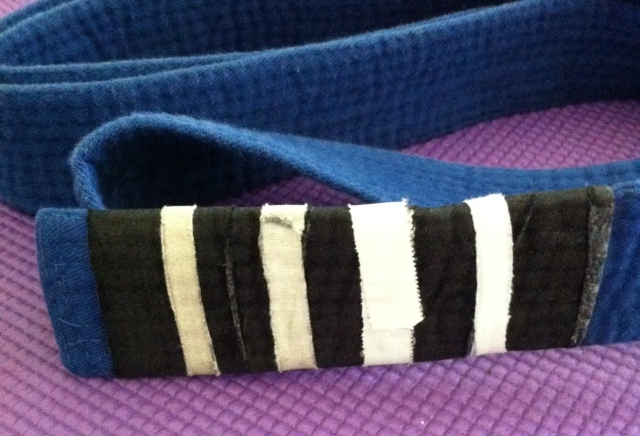 This last stripe marked the last stage of the blue belt journey before the next stage of the Gracie Black Belt experience, Purple belt. Right afterwards, a brown belt, told me that I needed to step it up on everything. I agreed. As of right now, I needed to get in a lot more classes.. I had been doing a lot of technique class and less with the practical, sparring and advanced techniques class. I hope to get in a lot more time with sparring in the next six months. One thing that I need to practice more is tightening up the neck and chin down to slow down a choke attack. In fact, if anyone goes near your neck for a choke, tightening of the neck and chin down, should be automatic.. I always try to put the chin to my chest if I know the choke is happening, judo technique from the 70s that I learned, but the neck tightening is new and difficult to do. I didn’t learn that. You don’t shrug the shoulders while tightening the neck. . I haven’t fully mastered the technique. Perhaps some of you have noticed my weight loss. Three weeks ago, I went on a super intense fast. I went without eating for five days. I would drink lemon water with maple syrup, or coconut water, whenever I got super hungry. In the mornings, I would do a salt water flush. Another thing I did was work out. I would work out and acted like I had eaten a big meal. I did lose 10 1/2 pounds. When the body couldn’t get energy from food, glucose, sugar, it would switch to energy from fat, ketones. This ketone energy helped mankind survive famine or days without food. The fat conversion to ketone energy process will happen if you don’t eat after 14 to 16 hours. The human body can go without eating for 30 days or more. It will consume the fat before it will consume the muscle. I wasn’t going to take the diet that far where it would damage muscles.. I don’t recommend this to anyone and it may not be safe. Sportsmanship. Every opponent should be given the opportunity to tap before breaking an arm, a leg, or a choke out. Jiu Jitsu teaches us control. In any sporting event, if a person offers a hand, as in hand shake after a match, the right, honorable thing to do, would be to shake hands. That would be very disrespectful not to do it. If you didn’t, that would show the true character of the person. It is very important to have balance in ourselves. We need to be kind and charitable to counter the violence of Jiu Jitsu.